BBC: Child sexual abuse: How big is the ‘iceberg’? The sexual abuse of a child has to be one of the most distressing issues any society has to confront. That is particularly true when the abuse is happening within the family – the place where a child should be safe. We’ve known for a long time that only a relatively small number of abuse cases come to the attention of the authorities, but this report by the Children’s Commissioner for England is a comprehensive attempt to measure and understand abuse that is hidden from view. Its conclusion that only one child in every eight facing sexual abuse comes to the attention of the authorities is a staggering figure, but it does not surprise many working in the field. Experts will often describe the abuse that is reported as the tip of the iceberg. This research attempts to measure the whole iceberg. Calculating the scale of the problem is valuable, but perhaps more important is what it tells us about how we as a society respond to abuse. There are huge taboos – particularly when abuse happens within a family – and this report underlines just how difficult it is for children to find the right words and the right person to tell. The researchers collected data from all the police forces and local authorities in England. They reviewed existing research and more than 750 survivors of abuse took part in a survey – probably the largest of its kind. The report says most abuse victims didn’t tell anyone about what was happening to them until they were 12 or older. It also found the abuse usually began when they were much younger. 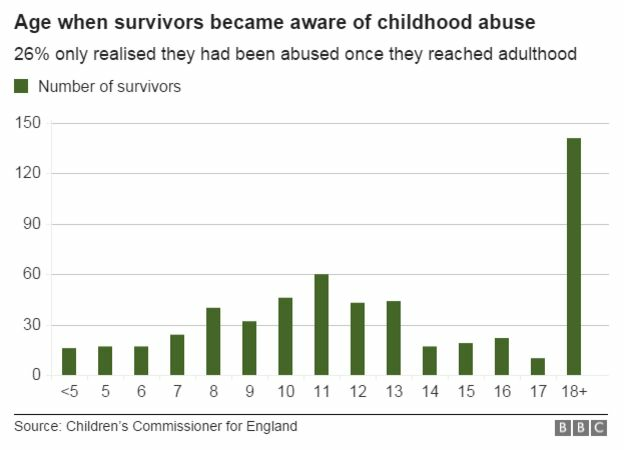 Responses from the survivor survey suggested that around nine was the most common age for abuse to start. 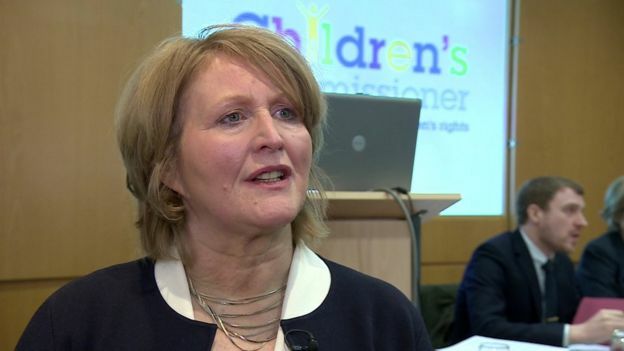 “At the moment we rely on children being able to tell adults,” says Anne Longfield, the Children’s Commissioner for England. But one of the most disturbing findings of the research is that when children did pluck up the courage to tell someone, the abuse often continued. Most chose to tell their mother, a friend or a teacher, but even if they told the police, in many instances they still weren’t protected. Prof Jenny Pearce, of the University of Bedfordshire, carried out research for the report and was part of the inquiry team. She thinks abuse, particularly within families, is really challenging for society. “Child sexual abuse flies in the face of everything that we expect of the family,” she says. BBC Magazine: Are paedophiles’ brains wired differently? The children’s commissioner wants a complete rethink of the way in which the authorities tackle child abuse. Her report calls for better training for all professionals involved with children so they can spot signs of abuse. It also says children as young as five should have what it calls “lessons in life”. In these they would learn about healthy, safe relationships to encourage them to talk to an adult if they are worried. This is the first of two reports by the commissioner. Now the scale of the abuse has been assessed, the next step will be to look in detail at what needs to be done.